Explore some of the exciting and varied resources on offer to epic you and your young people. Part of helping to equip others comes through sharing resources that we’ve created but much of it comes through signposting you to the fantastic work of others. We’re always trying to update and add to these resource pages. Let us know what you need ideas or advice about and we’ll get searching or writing. Also let us know if you’ve come across something that you think could help others. Finally, if you find chatting to someone more helpful than reading please just give us a call. Valentines Pick ‘N’ Mix helps young people to explore different aspects of love, in all its different shapes and forms, discovering the different relationships it impacts on. Easter Pick ‘N’ Mix provides an opportunity for young people to explore the real meaning of Easter in an exciting, challenging and memorable way. Ascension Pick N Mix is a fantastic resource to help our young people focus on some key promises that Jesus made. Pentecost Pick N Mix is a fantastic resource to help our young people focus what happened during Acts 2 and how that affects their lives today. Exam Pick ‘N’ Mix is a way to celebrate the end of the exam period, as well as look at the future in hope and focused on God. A definite way to release the worries and stress in a fun and God-focused way. Take a look at our Exam Postcards which you can send to your young people during the exam period to support and encourage them. Click here to visit the shop page. New Start is aimed at pupils and students to be used during September/October of their new term at school. For some this is a brand new school, for others it’s the start of a whole year, either way the reality of this change can be overwhelming. New Start hopes to help guide, comfort and provide young people with time to process this change now it’s actually happening. No Trick All Treat Pick ‘N’ Mix guides you and your youth group through the tricky season on Halloween, learning how we can be a shining light for Jesus. WARNING: Contains activities that involve fire. 2018 marked 100 years since the end of WW1, and we are encouraged to become united and we remember this important time. Remembrance Day Pick N Mix allows you to create a youth session to mark the anniversary, providing you with inspiration and ideas which stretch beyond your youth group walls. Christmas Pick ‘N’ Mix follows an overall theme of how we can shout out for Jesus over the noise of secular Christmas and why that’s important. 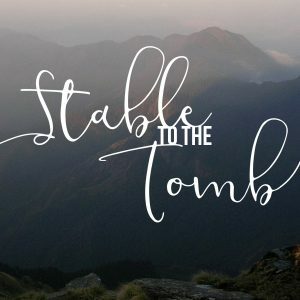 Stable to the Tomb is back fro 2019, discover the extended resource for yourself by clicking the button below. £4 for a pack of 20 with four unique designs, click here to purchase. The heart and vision behind the production of these postcards is to help churches to stay connected with, and communicate how much those sitting exams are loved, supported and valued. 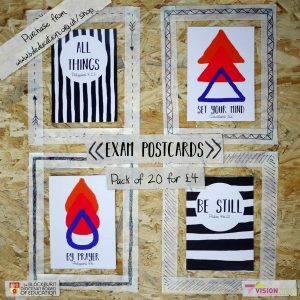 Exam session is often a period of disconnection for young people so the exam postcards act as a way to send a personal message of support and encouragement to them during this time. Whether you send one or four to each young person, these cards have the potential to make a huge impact. You could also use them as an invitation to an event to mark the end of exams. Such an event would be a great way to reconnect with young people post exams. We will soon be releasing an Exam Pick ‘n’ Mix (which you’ll be able to download above), which provides a variety of ideas to help the young people truly celebrate the end of this time period, whilst an opportunity to reflect on the future with hope. We have created two resources to using during Thy Kingdom Come this May. One is a downloadable prayer card for your young people and the other is a pew card to encourage your congregation to pray for the young people in your parish. Take a look at the Thy Kingdom Come page to find out more and order your free pew cards.